So far our garden is doing very well. The tomato plants are hanging heavy with fruit, the basil plants are bushy, and some of the peppers have started turning yellow, purple, and red. With all the vegetables coming in from the garden now, we are busy harvesting each day, and cooking and putting up what we have. There’s something about sautéed peppers and onions when they get soft and blackened a little around the edges, they make any dish better, including fajitas. I eat fajitas as much for the peppers and onions as anything else, about the only thing better to have with fajitas is guacamole. 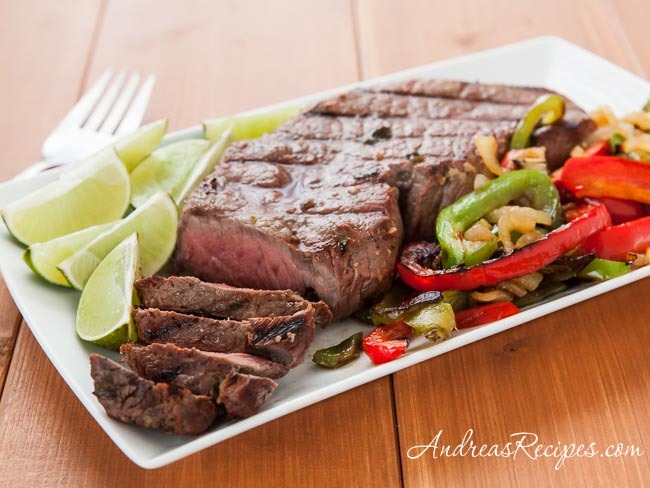 This fajita marinade I adapted from Cooking Light quickly became a favorite for us. The original recipe calls for Worcestershire sauce, which I skipped and used Modello beer instead, adding a bit more than suggested and saving the rest for dinner. The lime and beer combination worked well as a marinade with the spices and made for some good fajitas. The recipe also calls for chicken and for marinating and grilling the vegetables, which I changed up a bit. However you decide to do it, give these a try when you want some good Mexican food at home. Flank steak, also called London Broil, is the most common meat for fajitas. If you can’t find flank steak, a skirt steak or even round steak will work. Pounding the meat a little to tenderize it helps, as well as a long stay in the marinade. 1. MARINADE: In the small bowl, stir together all of the marinade ingredients, set aside about 1/2 cup for the sauce, then pour the rest over the flank steak in the gallon bag. Seal well and turn the bag over a few times to make sure the marinade fully coats the steak. Set in the refrigerator to chill overnight. 2. Heat the oil in the skillet over medium to medium high heat. Add the peppers and onions and cook while stirring occasionally until they are soft and shiny with browned and blackened edges. 3. While the peppers and onions cook, preheat the grill. Discard the marinade and cook the steak to medium rare, about 8 minutes on each side, or longer as preferred. Remove from the grill, cover with foil, and allow to stand for 5 minutes while the juices settle in the meat. 4. Bring the 1/2 cup of reserved marinade to a boil, then remove from heat. Cut the steak diagonally across the grain in thin slices. Place the steak, peppers, and onions on a serving platter and drizzle the heated marinade over the meat. Serve immediately.